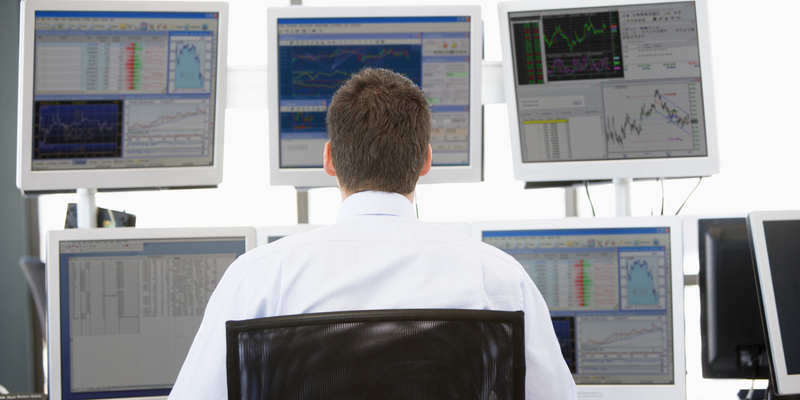 High frequency trading (HFT) firms continue to make the news with demand for ultra-low latency (ULL) networks. The recent announcement by ZAYO Group that an HFT firm had signed up for their ULL network, including dark fiber and a wavelength solution, is just one example. In this article, the effort by the industry to mitigate latency in support of HFT and other low latency applications is examined. HFT is a process by which very fast processor computers and sophisticated algorithms are used to transact huge amounts of stock trades in fractions of a second. The computer algorithms analyze multiple market trends and automatically execute orders based on those trends. Professor Jonathan Macey of the Yale School of Management likens HFT to a motorcyclist, who after noticing a truck/lorry driver speeds up to buy all the fuel along the highway. When the truck driver gets to a gasoline/petrol station, the motorcyclist sells him fuel at a premium knowing that the trucker does not have any other options. While the profit realized by executing a single trade is minuscule, high frequency traders make huge profits by executing a large number of trades. The key to success in this trading game, which has been criticized as parasitic, is speed. Speed that comes with computer processing power to analyze market trends and the speed of executing trades ahead of anyone else. For more on high frequency trading you can also read Michael Lewis’s book, Flash Boys: A Wall Street Revolt. While some traders have been able to drastically reduce latency by collocating with the stock exchange and optimizing the server processing speed, some must access more than one exchange such as Chicago and New York or London and Frankfurt. As a result, optical networks connecting financial institutions between these locations must be optimized for latency. The most important contributors to latency in an optical network are the transmission fiber, dispersion compensating fiber and the process of optical to electrical conversion or vice versa. We will look at latency and its mitigation in these components and processes. Optical fiber is the most important contributor of latency in a long-distance optical communication network. The length of the optical fiber represents the distance traveled by communication signals from one point to another. While the light travels at a speed of 299,792km/s in free space, the speed is reduced to about 204,190km/s in a standard single mode (ITU-G.652 compliant) fiber. The ratio of the free space speed to speed in fiber is the group refractive index of the fiber which is 1.4682 in this case. A number of manufacturers are optimizing their manufacturing processes to reduce latency, even if it is by a tiny amount. The following table shows the performance of two of the industry’s leading fiber optic brands. While the latency values for these fibers look almost the same, the difference in latency between the two extremes translates to 21µs over 1,000km, a significant value in HFT. Even when traders are collocated with the stock exchange servers, they still put an effort to squeeze out whatever latency they can to get an urge over the competition. With HFT, researchers working on hollow core, photonic crystal fiber (PCF), have found an extra incentive for their work. When commercialized, these fibers could play a pivotal role in HFT and other low latency applications. Photonic crystal (or photonic band gap) fiber is a new type of fiber based on a special class of optical medium with periodic modulation of refractive index. 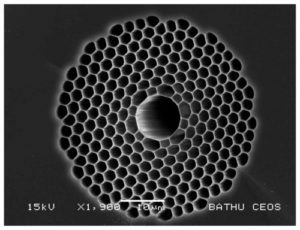 The structure of a hollow core fiber is shown in the picture. Because of the absence of glass in the core, light in a hollow core fiber travels close to the speed of light in a vacuum – significantly reducing the latency. Researchers from Infinera, Molex, Lumentum and OFS Fitel have demonstrated that hollow core fiber can reduce latency by 30%. See their publication on Researchgate – Transmission of Commercial Low Latency Interfaces over Hollow-Core Fiber. One important impairment that occurs in optical fibers in long distance optical networks is chromatic dispersion. A phenomenon caused by the wavelength dependence of refractive index, chromatic dispersion (or simply dispersion) causes the broadening of digital pulses. The transmission fiber must be compensated for dispersion before pulse broadening result in the interference of adjacent symbols and distort the signal. The compensating modules are typically inserted on transmission spans between erbium doped fiber amplifiers (EDFAs) – see illustration. Typical dispersion compensating modules consist of special type of optical fiber with negative dispersion relative to the transmission fiber. The length of the dispersion compensating fiber introduces additional latency in the network. A typical DCF module required to compensate 80km of standard (ITU-G.652) fiber at 1550nm introduces at least 60ns of latency in the network. With multiple spans on a link, the latency quickly adds up. Non-zero dispersion shifted fiber (NZDSF) such as ITU-T G.655 or ITU-T G.656 fiber is sometimes used to reduce the number of DCMs in the network. NZDSF has significantly lower dispersion in the C-band (around 1550nm) transmission window and requires fewer compensating modules and therefore it enables lower latency networks. As an alternative, dispersion compensating Bragg gratings (FBG) are used for compensation because they introduce negligible latency in the system. A FBG is a fiber based device that reflects light due to the modulation of its core refractive index. Light propagating in the grating is reflected if its wavelength matches the periodicity of the core modulation. Selective reflection of components of light at different positions along the grating is used to compensate for incoming high dispersion light. See the article, Fiber Bragg Gratings: A Versatile Approach to Dispersion. Because Bragg gratings are significantly shorter than dispersion compensating fiber, they introduce significantly less latency. In certain cases, it is inevitable that transmission signals are converted from electrical to optical and vice versa. The conversion process introduces a delay which manifests itself as network latency. Transponders and muxponders are some of the network components that operate on O-E or E-O conversion. A transponder takes a short reach LAN optical signal, converts it to electrical and then back to optical while modifying it to a specific DWDM wavelength for transmission over a long distance. A muxponder, on the other hand, takes low transmission speed signals, multiplex them together into a higher speed signal with a specific DWDM wavelength. Both transponders and muxponders can introduce significant levels of latency in the network, up to 10µs. Manufacturers are making every effort to improve their manufacturing processes to reduce the latency. While several applications such as VoIP and gaming are requiring improvement in network latency, it is the high frequency trading application that is demanding the most stringent latency specifications. The industry is focusing on different parts of the optical communication network to reduce latency. A lot of focus to improve latency is on transmission fiber, dispersion compensating fiber and E-O and O-E conversion. For in-depth discussions on optical networking, join a fiber optic training class near you.